There's nothing better than a hot cup of tea or coffee to start the day. 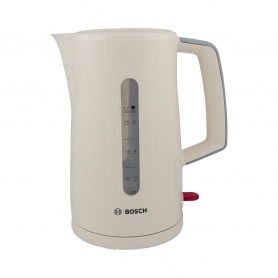 With the Bosch TWK3A037GB jug kettle, you get a quality product from a well-known brand. Team it with the Bosch TAT3A017GB toaster for a winning breakfast duo. Or why not try the super-stylish black Bosch jug kettle? The TWK3A037GB has a large, 1.7 litre capacity making it an ideal addition to family households. To make sure you do your part to save energy, fill the kettle with just the amount of water you need. It also features a stainless steel base with concealed heating element. This means the TWK3A037GB has less limescale build-up and will last for longer. 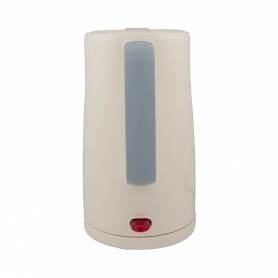 The lift switch-off mechanism means you can simply lift the kettle from the base to turn it off automatically. To keep your kitchen looking tidy, this Bosch kettle features integrated cable storage. 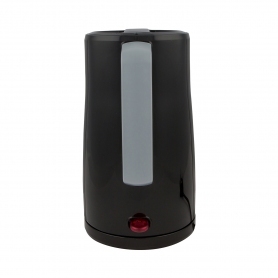 Whether you're right or left-handed, the TWK3A037GB is ideal, with its 360 degree base. It also has a double-sided water level indicator so you always know how much water is inside. With a Bosch kettle, you know you have a product built by a reliable household name. When it comes to domestic appliances, Bosch are at the top of the league in terms of quality and reliability. Bosch started out in Stuttgart in 1886 and now have a presence in over 60 countries across the globe. They are considered one of the biggest multinational engineering and electronics companies in the world - so you can feel safe purchasing one of their products from us. The TWK3A037GB cream kettle is the perfect addition to your family kitchen, especially if you can't do without your hot drink in the morning. This fantastic kettle is available to purchase now. Alternatively, contact us for more details.